A Middletown woman was arrested after chasing children, urinating on a porch, and blocking traffic - all while wearing a cow suit. 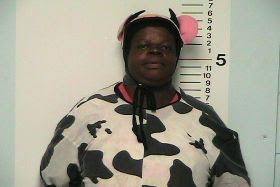 Police said 32-year-old Michelle Allen was chasing children while wearing the cow costume early Monday evening. Allen also reported urinated on a neighbor's front porch. An officer told Allen to go home and stay there for the remainder of the evening. Police were later called to her home where Allen was allegedly blocking traffic. The arresting officer says Allen smelled of alcohol, slurred her speech, and was belligerent. She also allegedly cussed at the officer. Allen is charged with disorderly conduct. Darling what can you expect from a Republican!